Dream, Create, Inspire: No Tricks, Just Treats! Happy Halloween to everyone! 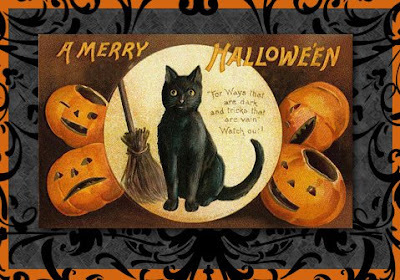 I hope you have LOTS of treats ready so that the little goblins don't get ya! I can remember as a child how the excitement of Halloween was always such fun. That is if you don't mention the amount of times that it was cold or rainy or both here in the midwest and we had to cover our costumes up with winter coats. Bummer! Definitely not quite as thrilling as running up and down the streets, going door-to-door in your spiffy pirate costume or pretty princess ballgown. But the end result - big bags full of candy - was the same, so who's complaining? And if you're too tired to get out the carving knife to turn your pumpkin into a Jack-o-lantern, you may want to try your hand at virtual pumplin carving here. And after all the spooks are finished haunting your house, don't forget to visit the Joli Paquet blog. All the wonderful glitz and sparkle begins tomorrow - November 1st!!!! Lori Karla from My Fairie Window has something fabulous lined up to launch our special holiday event.